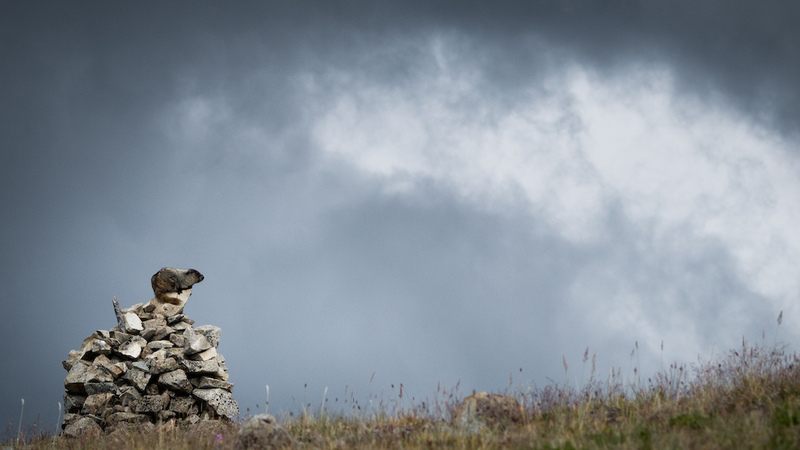 The camels that gave their name to the Camelsfoot Range were mostly dead before Canada existed, or B.C. had any borders. A long time ago, some crusty psychopaths, allergic to the comforts of the “known world”, ventured out into the fearful wilderness (occupied by a couple hundred native nations) and, in 1861, struck gold in the place we now call Barkerville. At that time, the queen’s long, global reach extended no further than Vancouver Island, some 1000km away. Still, a royal thirst for gold had reclusive white dudes fighting their way into all corners of the West, looking for glory and riches that mostly didn’t exist. Not for them, anyway. Once some fool actually found some real gold, more well-socialized people wanted to go get not-rich standing around in Barkerville’s cold, toxic mud all day. Besides, small pox was wiping those couple hundred independent native nations off the map, making the uplands of BC easy to steal for any motivated British subject. The easiest way to get there from the edge of Her Majesty Victoria’s empire at first appeared to be the low route along Harrison Lake and Seton Lake to Lillooet, and then up the west side of the Fraser to a ferry at Big Bar. Someone with more business sense than the would-be-miners constructed a mediocre trail from Lillooet to Williams Lake in 1862, and charged all the not-yet-rich pioneers to travel on it. The story goes that someone posted an ad in Victoria for some Bactrian camels, and a few fellows thought they’d found a real deal on these 23 funny-looking horses. Soon they were shuttling supplies up to the Cariboo. The idea is not even glaringly terrible. 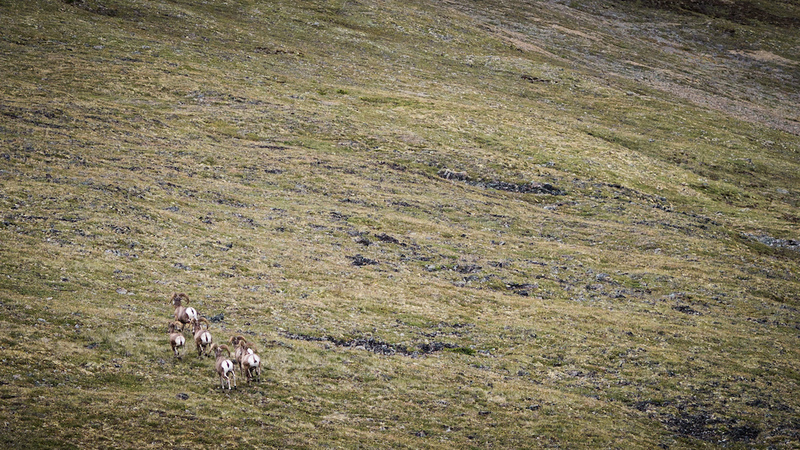 I would think a Sino-Mongolian camel could easily handle a Cariboo winter, and they can carry twice as much as a mule. Alas, their soft feet were torn up by our rocky soil, they stank worse than the pioneers, and they weren’t terribly obedient. Seriously, their smell would cause loaded horses to commit suicide off the edge of the canyon. 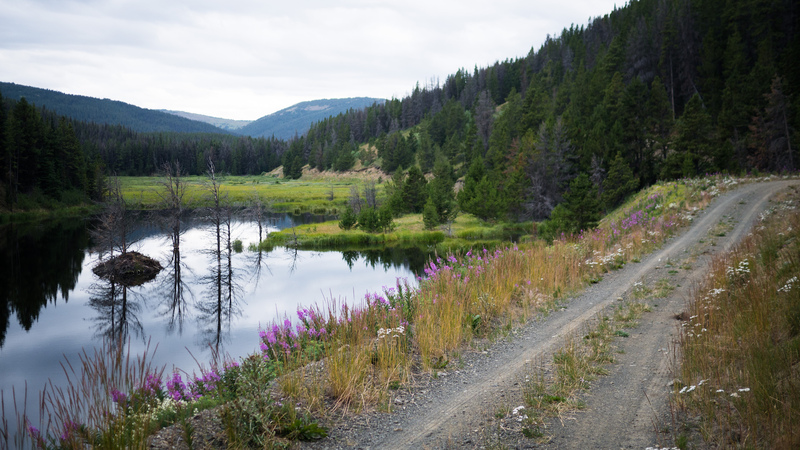 Many of them reportedly escaped into these mountains west of the Fraser, in those “Old” Cariboo Road days, and into the hills around Clinton when the main route was revised into the Cariboo Road by some road-toller with better marketing skills, a few years later. Finding gold was no easier for Panthea and I when we travelled there than it was for the bearded weirdos of by-gone days. 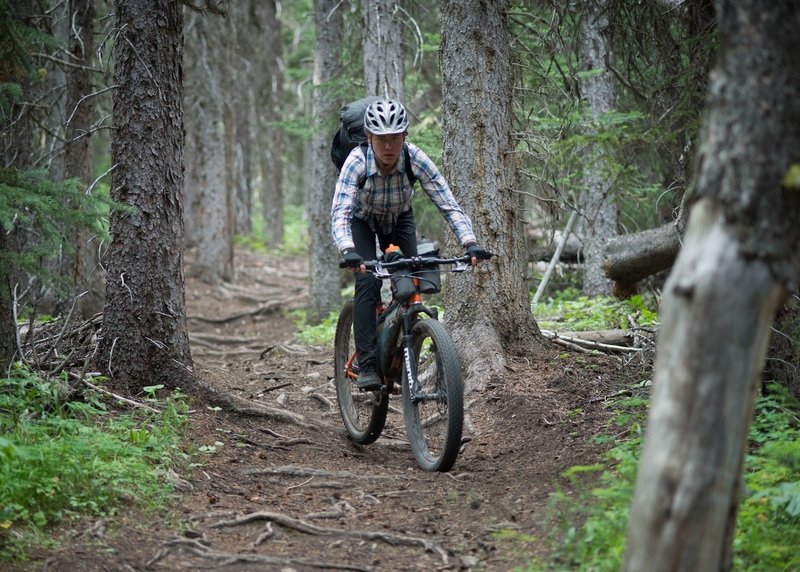 But, our efforts paid off and, on our second try, we found a bikepacking route of Canada’s finest mint – five nines fine. We got cooked in the smoky heat of the Fraser Canyon, and failed to reach the Camelsfoot Range on our first attempt. Joined by friends Marius and Adriana a few days later, our second approach proved more fruitful. 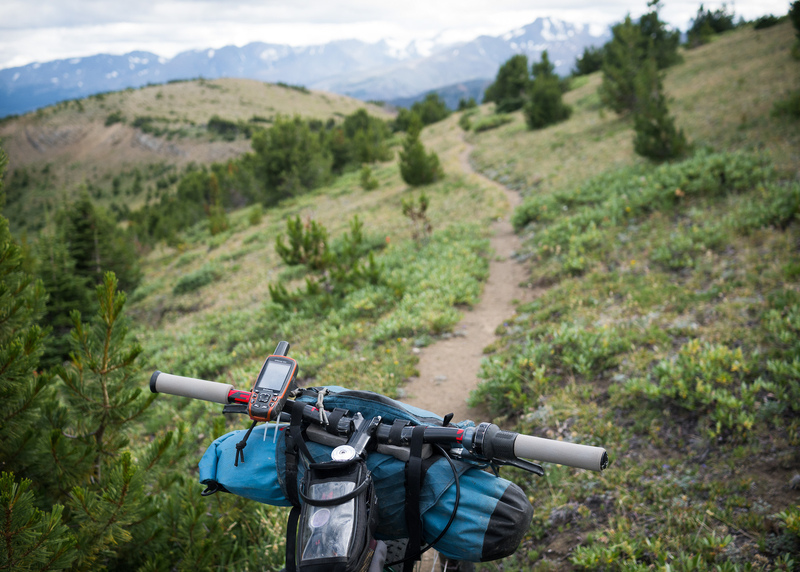 The making of a bikepacking route is at times frustrating. 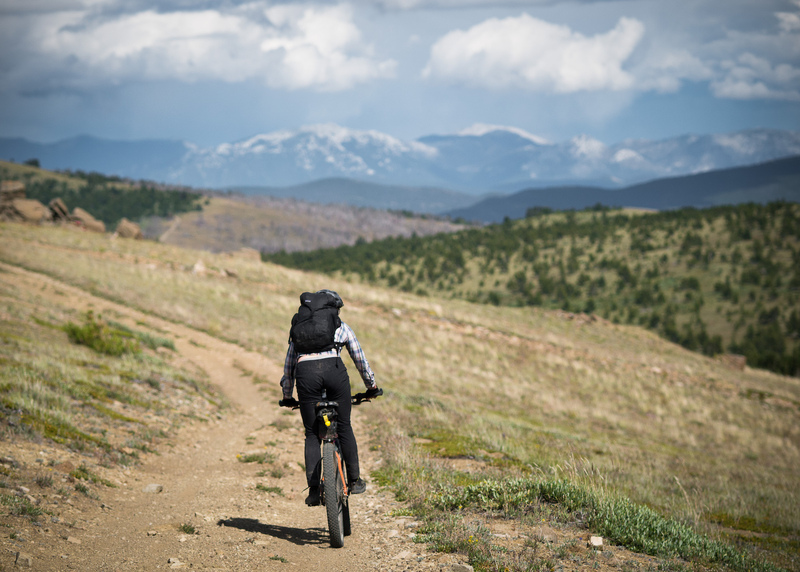 Usually, anyone wanting to ride their bike for more than a day just follows the road map to wherever they want to go. We don’t care were we go, only what the riding is like. The less likely it is for a road to appear on a map, the more likely I am to enjoy it. 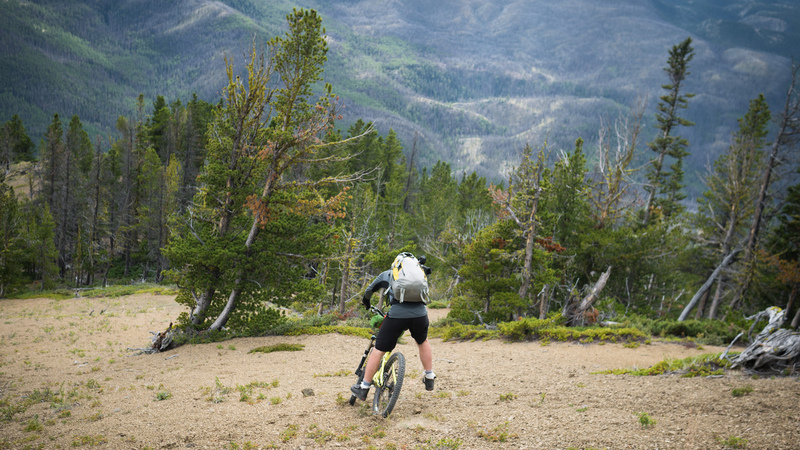 If it can be linked with singletrack trails, even better. 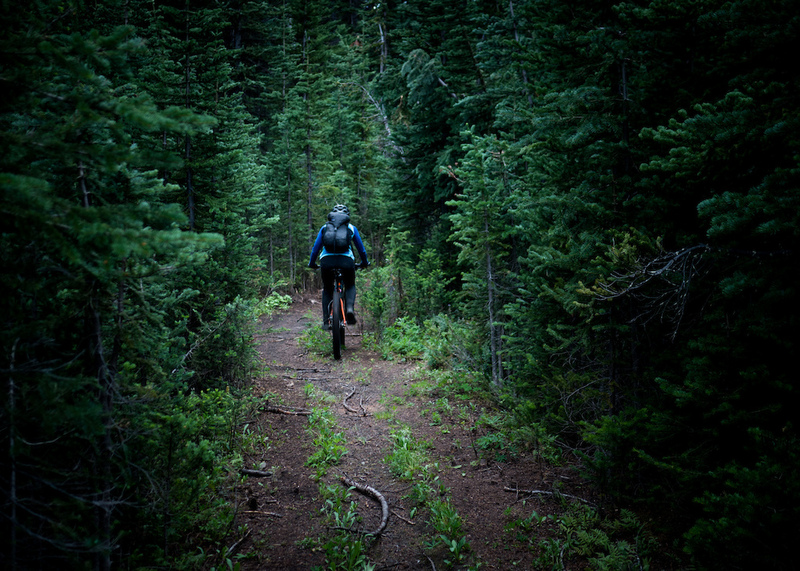 If there are no trees and smooth ground, we don’t even need a road or trail. That means alpine, and alpine is code for scenic. I like that best. Since not many people are into this – it’s an emerging market for the marketers out there – there’s no information, so I do a lot of squinting at Google Earth. I noticed an unusually long and gentle alpine ridge making a stripe across the Camelsfoot Range – Nine Mile Ridge. Good name, right? Parallel, and just north, is the now closed China Head FSR. “Washed out.” “Very rough.” “Only suitable for 4WD vehicles.” Easily linked into a loop with that big ridge. Perfect. I had proudly drawn what appeared to be a gorgeous loop in the middle of nowhere, at least 50km to a road suitable for my minivan in any direction. In a couple places, the line involved some wishful thinking and guesswork. That’s the step I think a lot of people are missing when they tell me about their struggles to plan a route. Usually, no one can tell me if my intended route is going to work. At a certain point, you just have to count on the last puzzle pieces appearing, or on a bit of your own grit to make do without. Panthea and I left the car in Clinton on our first attempt to access the Camelsfoot loop, and approached by the most obvious road, from the east. 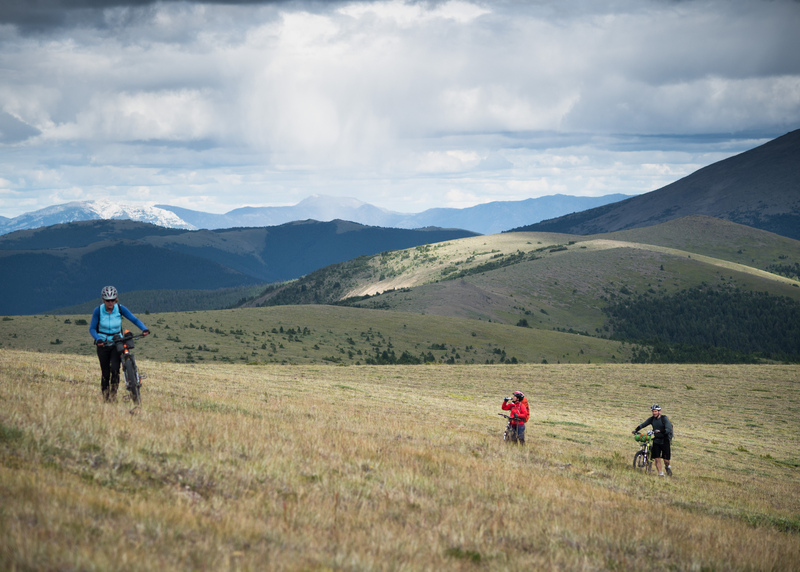 With plans to ride with friends in the South Chilcotins only four days away, we had the lofty goal to ride it in three unreasonably long days. Arriving at the Big Bar ferry, which plies the same crossing of the Fraser used 150 years ago, after only 70km, we were thoroughly cooked, and over 2000m vertical below the top of Nine Mile Ridge. Another 4km on we found the first spring and stopped. It took us two days to backtrack to Clinton in our heat-exhausted state. 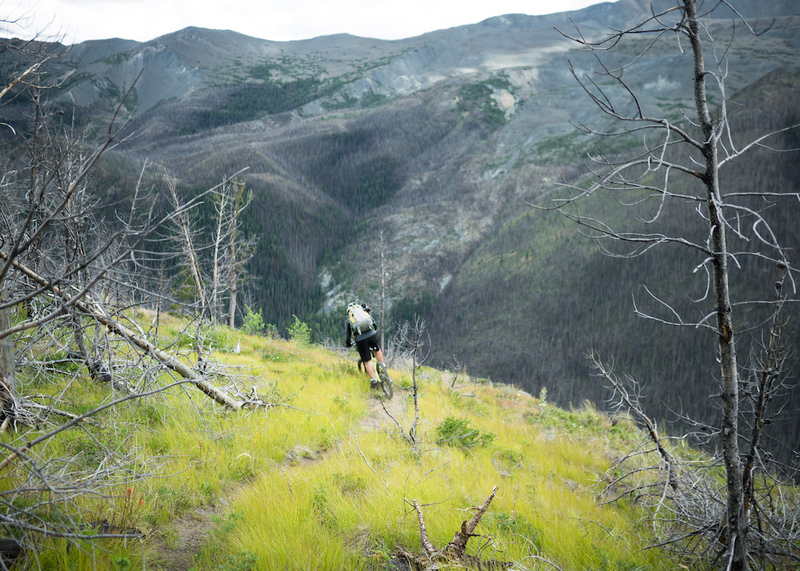 United with friends in the South Chilcotins, this time we headed east – around the top of the Shulaps Range, across the upper reaches of the Yalakom Valley, and on to our elongated loop, twice across the top of the Camelsfoot. 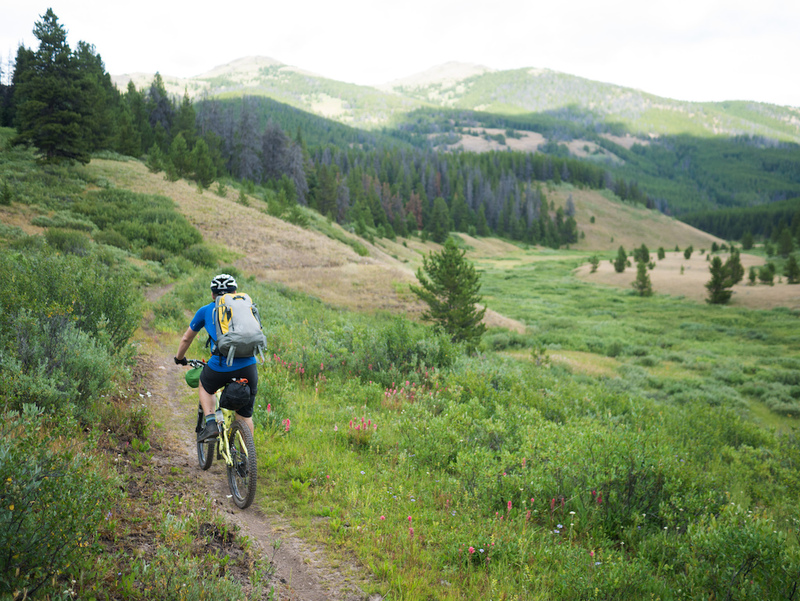 Over four days, and 160 tough kilometers, we found a perfect backcountry riding cocktail: buff meadow singletrack, nirvanic alpine doubletrack, a bit of bushwhacking, some trail-less alpine riding, burly big mountain DH, rooty forest trails, and a little bit of gravel grinding. 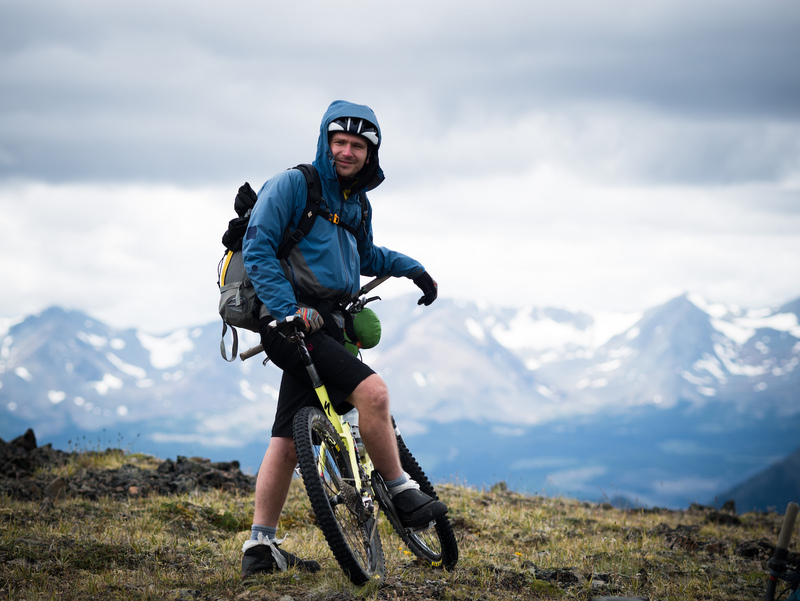 As the number of mountain bikers travelling into the South Chilcotins swells, so do the number of float plane trips, roaring down the valley, every hour in summer, with the drone of a Nascar event. 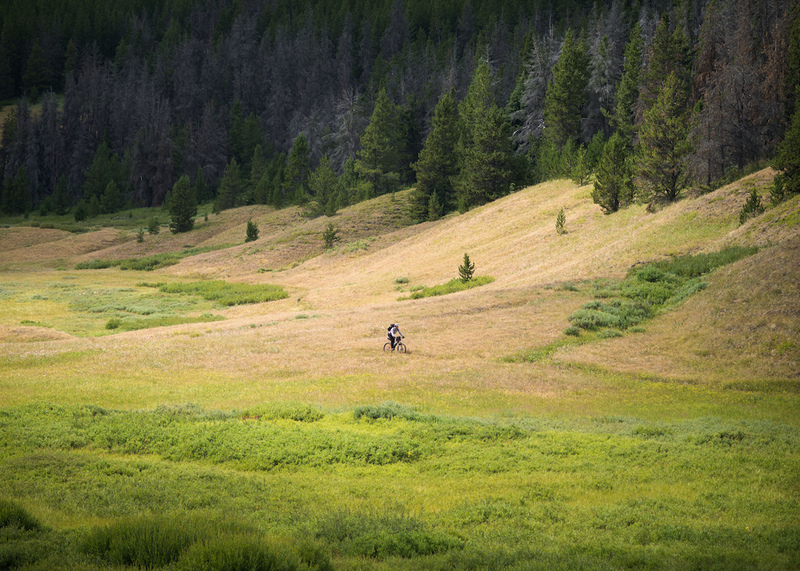 Ironically, a wilderness silence is easily found outside the park, on quad and moto trails that rarely see traffic outside of hunting season. 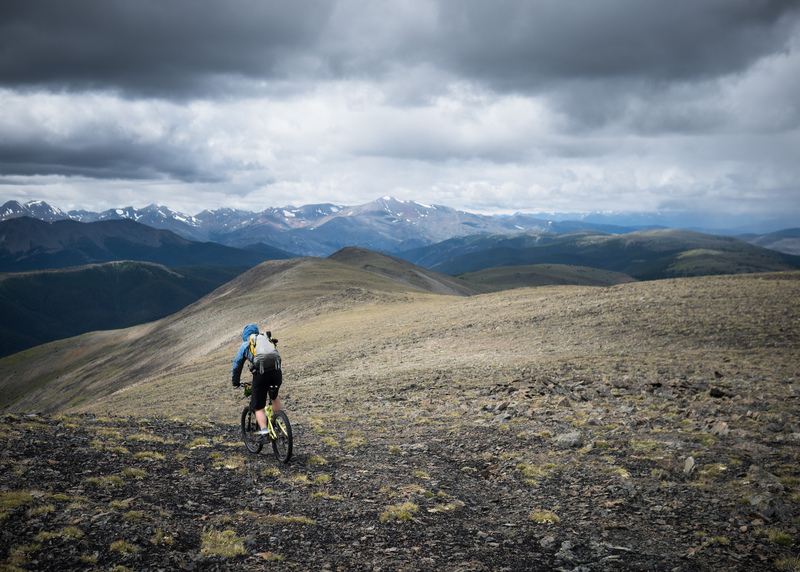 The back side of the Coast Mountains is a big place with many mountain ranges sharing the perfect climate and topography that has made the South Chilcotins a famous riding destination. 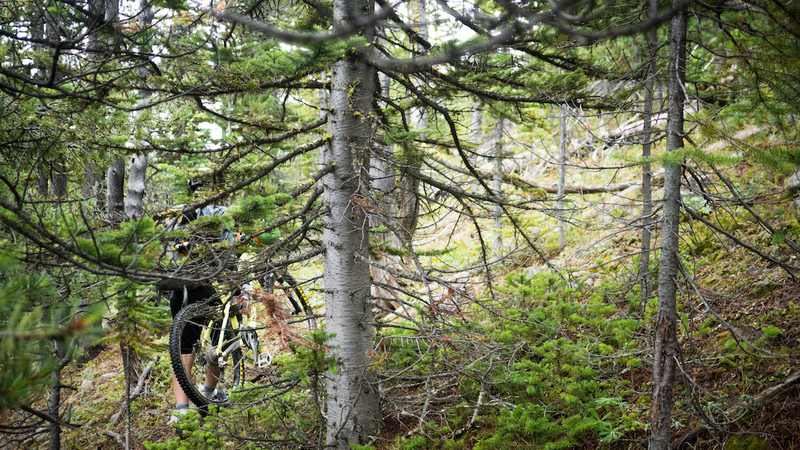 We were pleased to discover a network of high quality trails outside the boundaries of South Chilcotin Mountains Park. 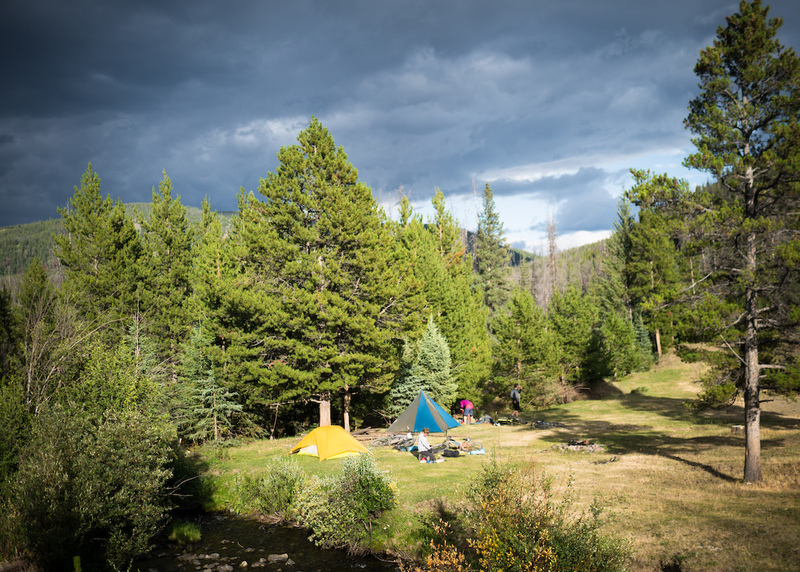 A few kilometers into our third day, the menacing clouds finally unleashed a deluge. Soon we found our connection on an old logging road totally impassible with gloppy mud. 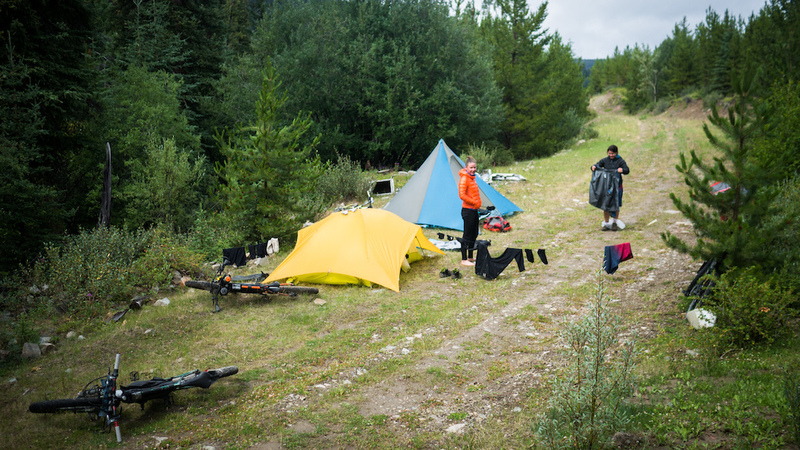 We made a camp, washed our bikes in a creek and waited. 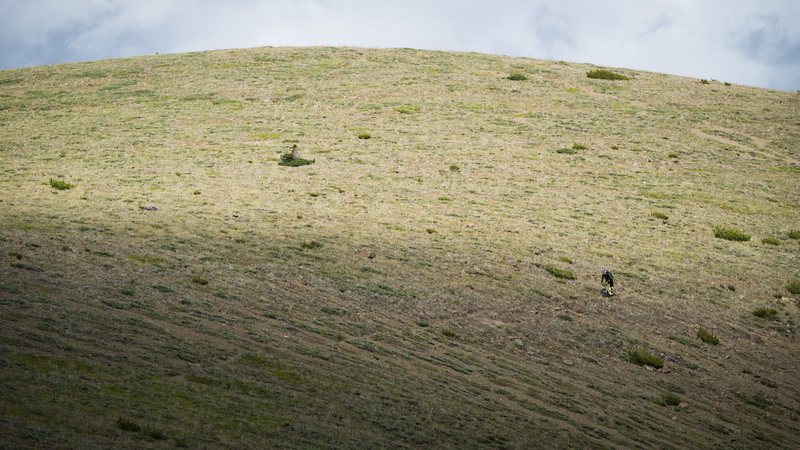 By late afternoon, the road was drying out, and we forged upward, aiming to climb part way up onto Nine Mile Ridge. And then it was all down hill. 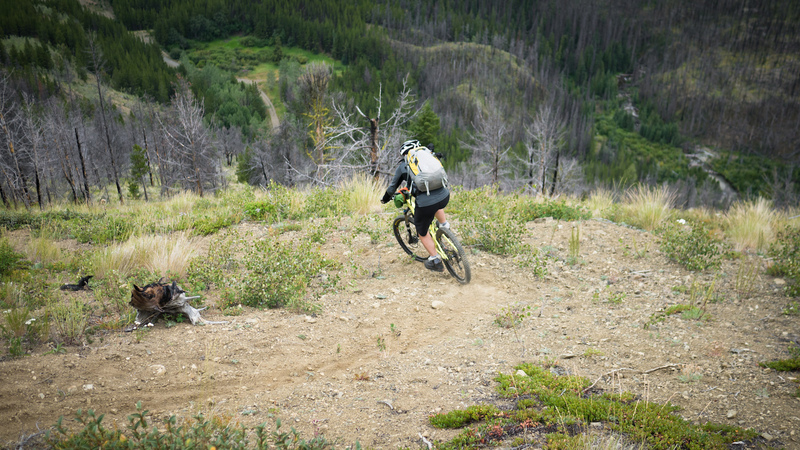 After several kilometers of open alpine free riding, we found a trail leading off the ridge and ever-steepening into a rowdy, big mountain DH run. Some final, exposed switch-backs brought us down to the Yalakom River, still 30km from the car. We rested with a bit of gravel grinding, before getting onto a quad trail, which faded into a single track with the daylight. 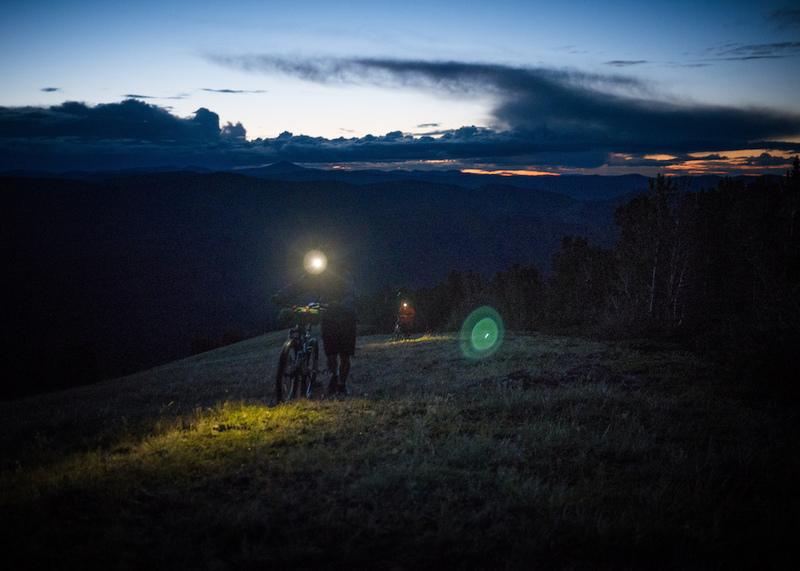 Another big, loose singletrack descent, this time in the dark, brought us down to our cars around 11pm. 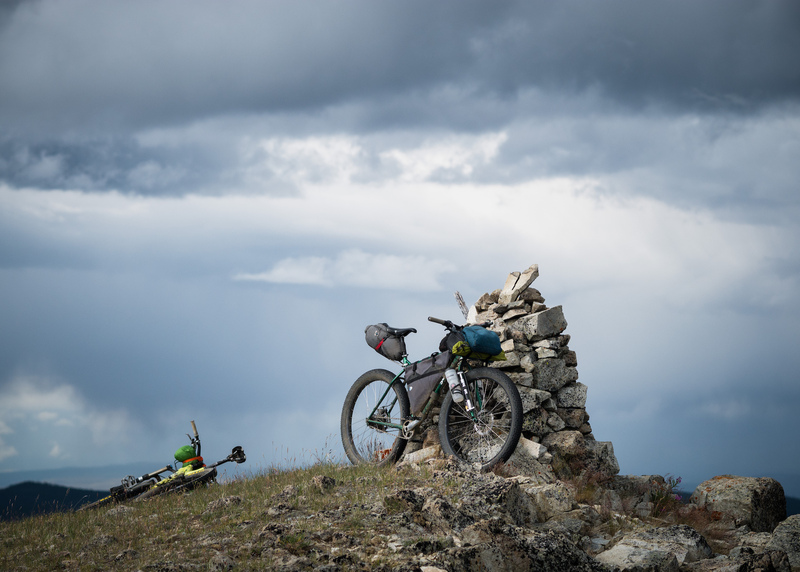 The ingredients of a five-star bikepacking experience are hard-won, and that is what makes such a riding cocktail so rewarding. 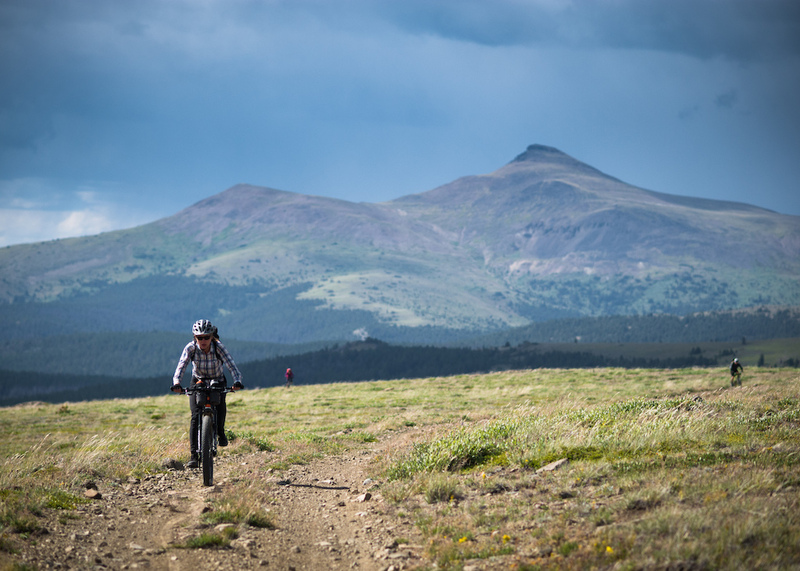 Away from the world of racing, shuttling, innovation, and marketing, mountain biking is distilled into its primordial essence. 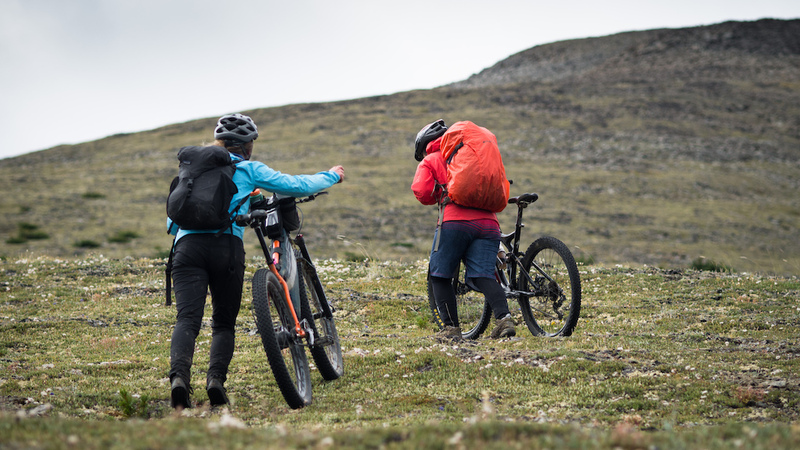 It's just pedalling bikes in the mountains. And it's fun. Looks like it was an awesome trip, great write-up! Hahahaha, he's got grocery bags between his socks and shoes. That's actually pretty smart. As long as the bag doesn't have holes in it from the start. Gallon zip-loc bags are a little tougher and will last longer without leaking. Maybe some day 5.10 will make shoe that doesn't soak up all the water in a 5 mile radius. 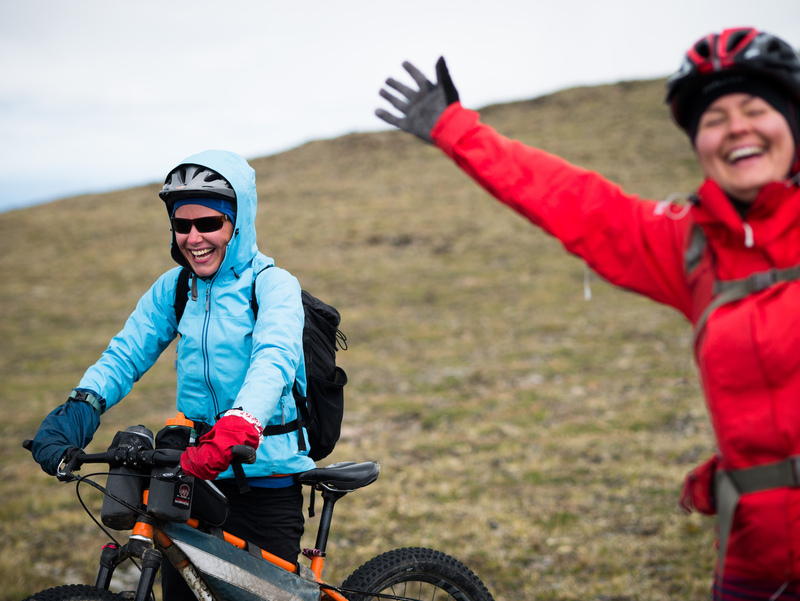 For a route guide and planning info, check out www.bikepacking.com/routes/bikepacking-the-camelsfoot-range. Super pictures. I wouldnt wanna carry all that mud on a phat bike tho !!! Excellent story. Sounds like you had a very challenging and rewarding trip. 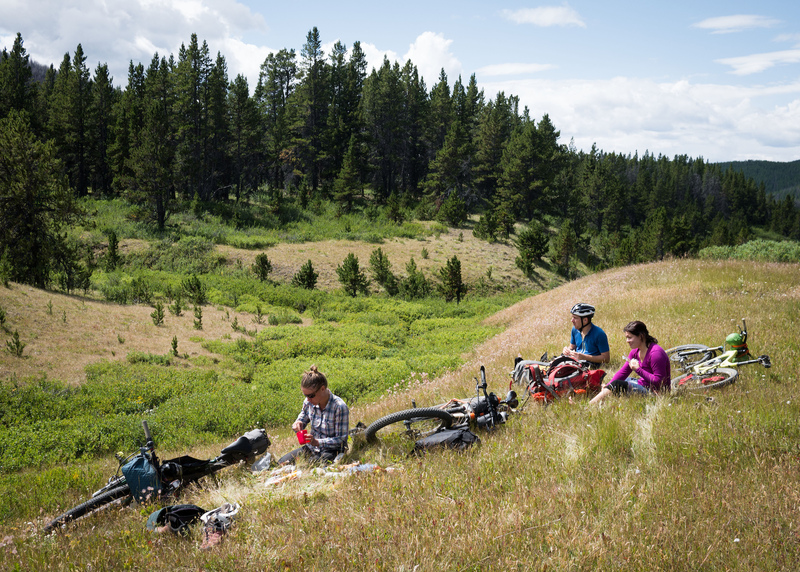 "Exploring" with friends - truly is the best kind of riding out there. Very nice photos. Fantastic! 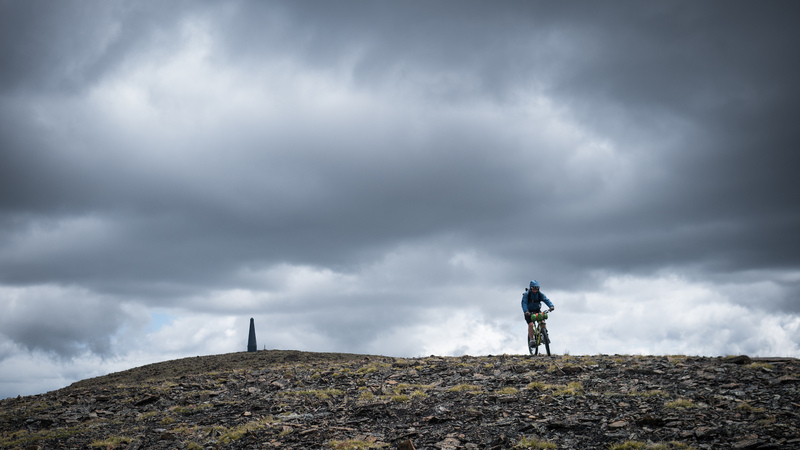 This is what mountain biking is all about. Wow! Looks very isolated. No other humans in sight. What I wouldn't give to suffer in style like that! Loved this, more content like this! Are 5 nines just knock off 5 10s? Nope, Soma B-Side setup with 2.8-2.9 plus tires, a rohloff rear hub and a Manitou Magnum front end. They look big, like 29+. These plus sized tires are making it hard to determine if something is a 29er, 27.5+ or 29+ or what have you. well they're only B Pluses. But that's one of the points to them, that they come out at nearly 29 inches but with a lot more air volume and footprint. I'm surprised the Fab B Nimble pulled that tight. Makes me wonder how many frames might be able to fit the 2.8 Rocket Ron on a 30mm internal rim. Well the Fat B's aren't even close to their claimed size either, they're at best 3.1s on a really wide rim. What's the deal with the handle bar? To lower the grip height I can figure...but is it a rotated "normal" bar? temporary fix/adjustment? a bar made specifically like that to compensate for a high front end??? dont wash bikes in the creek, you are polluting with oils, grease etc. ...so how do you expect them to wash them then?